When 18-year-old Quincy Thabang from Sasolburg heard the news that he’d won the Gert-Johan Coetzee bursary to study fashion design, the first person he phoned was his grandma. “I’m so excited about this wonderful opportunity, and I wanted to share that with my Granny immediately,” says Quincy, who will start his three-year degree course at the Northwest School of Design in Klerksdorp next year. 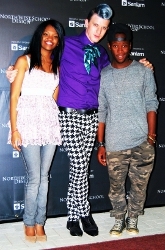 Gert-Johan Coetzee awarded the teenager the R160 000 bursary on the weekend at the NWSD graduation show. 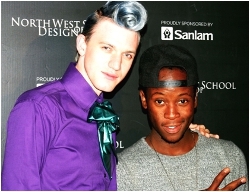 The quality of the entries for the Gert-Johan Coetzee 2014 bursary was so high that NWSD decided to award a second bursary to another finalist. Rebaone Malane, 19, from Mafikeng, won a R130 000 bursary to study the brand-new three-year Fashion Management and Communication course.